Arrow Academy’s June releases are two superb couple-on-the-run thrillers, a film-noir from Hollywood’s golden age of crime films and the world home video premiere of a neglected British crime classic - both restored to their pristine glory and supplemented with a wealth of extras. First up in June is Nightfall, a masterful film noir from Cat People director Jacques Tourneur, based on the crime novel by legendary pulp author David Goodis, and scripted by Oscar winner Stirling Silliphant (In The Heat of the Night). Aldo Ray stars alongside Anne Bancroft in this gripping and inventive late-period noir, on a release that features a new commentary and artwork, and comes with an illustrated collector’s booklet. 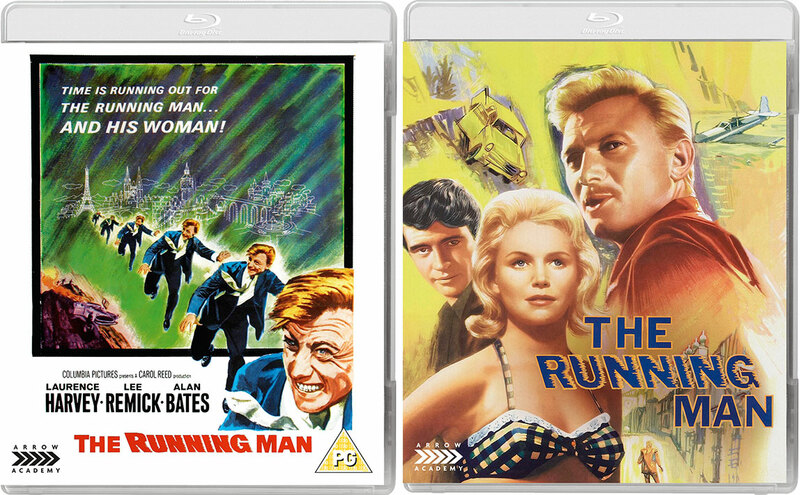 June also sees the release of The Running Man, from The Third Man director Carol Reed, starring Laurence Harvey (The Manchurian Candidate) as a man who fakes his own death and find himself on the run from insurance investigators. Also starring Alan Bates, Lee Remick and Fernando Rey, scripted by John Mortimer (Rumpole of the Bailey), and beautifully filmed by cinematographer Robert Krasker (who won as Oscar for his work on The Third Man with Reed), the special edition features a 2K restoration, vintage interviews and a fascinating new featurette. During his long and varied career, Jacques Tourneur (The Comedy of Terrors, Night of the Demon) tackled a breadth of genres on both sides of the Atlantic. With 1956’s Nightfall, he returns to the noir trappings he tackled so successfully with Out of the Past for a tale of deception, intrigue and paranoia. 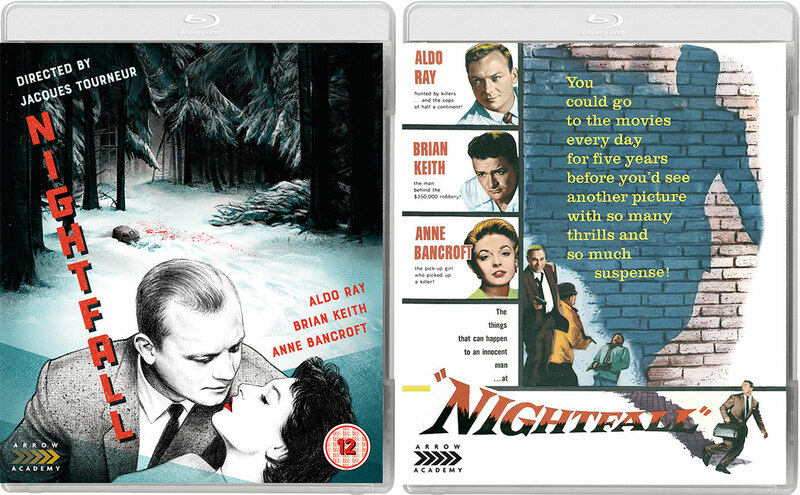 Adapted from the novel by prolific crime fiction author David Goodis (Dark Passage), Nightfall is the story of Jim Vanning (Aldo Ray – The Violent Ones, The Naked and the Dead), an innocent man wrongly accused of murder. On the same night he has a chance encounter in a bar with glamorous model Marie (Anne Bancroft – The Graduate), the hoods he’s spent the past year running from catch up with him, determined to recover the money they believe he stole from them. Pursued by both the hoods and law enforcement, Vanning and Marie go on the lam, leading to a desperate chase that takes them from the streets of Los Angeles to the snowy peaks of Wyoming. Over a decade after redefining the thriller with The Third Man, director Carol Reed returned to the genre with The Running Man. Reuniting with that film’s cinematographer Robert Krasker (BAFTA-nominated for his work here), Reed goes in the opposite direction visually, framing the twisty plot in sun-kissed widescreen colour. Rex Black (Laurence Harvey – Walk On The Wild Side) has successfully faked his death in a plane crash and escaped to sunny Málaga under a new identity, waiting for his wife Stella (Lee Remick – Anatomy of a Murder) to arrive with £50,000 of life insurance money. It’s the start of a blissful, trouble-free new life for the couple – until Stephen (Alan Bates – Gosford Park), the insurance agent in charge of investigating Rex’s death, suddenly arrives in town. Is he just holidaying in Spain, as he claims, or is he on assignment to foil Rex’s scheme? Adapted by John Mortimer from the novel The Ballad of the Running Man by Shelley Smith, this underappreciated entry in Reed’s celebrated oeuvre makes its official worldwide home video premiere, complete with insightful new bonus features.